Google is taking another shot at a Pixel tablet, with a high-end detachable meant to rival the iPad Pro and Surface Pro. 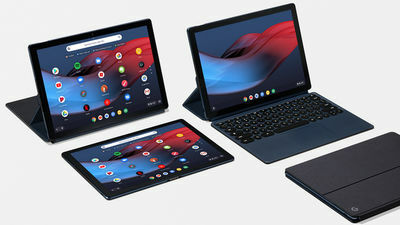 The Pixel Slate is a Chrome OS tablet with a detachable keyboard cover that turns it into something very closely resembling a laptop. It can get fairly high-end, too, with 8th Gen Intel processors on the inside that go up to a Core i7 paired with 16GB of RAM and 256GB of storage. While the tablet will be sold on its own, it’s meant to be paired with a keyboard cover that Google’s calling the Pixel Slate Keyboard. The keyboard has a stylish — but unusual — set of circular keycaps. It’s backlit, too, and Google says it’ll be quiet to type on. The tablet also supports the Pixelbook Pen, which debuted last year. The Pixel Slate will go on sale later this year starting at $599 with a Celeron processor, but it’ll run up to $1,599 and higher for better specced options. The keyboard will be sold separately for $199, while the pen will remain at $99.